Stock photo of snow capped peaks of the Selkirk Mountains and fall forest colors viewed from beside a natural pond in the Slocan Valley, Central Kootenay, British Columbia, Canada. Snow capped Selkirk Mountains and fall colors of forest viewed from natural pond in Slocan Valley. 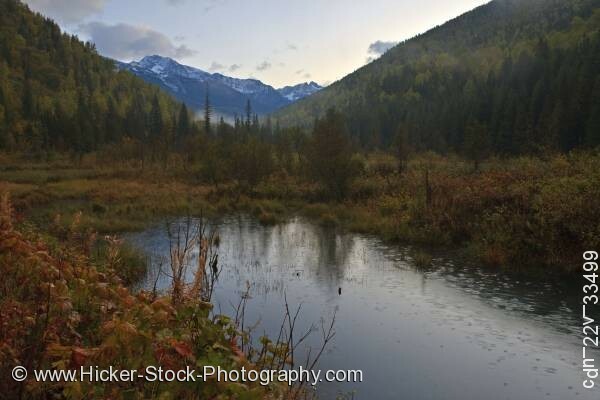 This stock photo shows the beautiful snow capped peaks of the Selkirk Mountains and colorful fall forest viewed from beside a natural pond in the Slocan Valley, Central Kootenay, British Columbia, Canada. An evening view shows the attractive fall colors of red and gold intermingle with the lush green foliage that surround a natural pond in the Slocan Valley. Tall dark evergreens are scattered throughout the valley lead to the striking view of the rugged Selkirk Mountains. Two hillsides frame the scenic view of the snow capped Selkirk Mountains. The rugged snow covered mountains are a striking backdrop to the Slocan Valley. Puffy white clouds hang low over the mountains within a soft blue sky. Snow capped peaks of the Selkirk Mountains and fall forest colors viewed from beside a natural pond in the Slocan Valley, Central Kootenay, British Columbia, Canada.